Congratulations to Our State Apiarist! 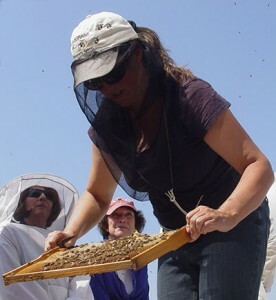 Tammy Horn Potter, our state apiarist, recently joined the Project Apis m. (PAm) Board of Directors. The mission of PAm is to fund and direct research to enhance the health and vitality of honey bee colonies while improving crop production. You can read more at: http://www.beeculture.com/catch-the-buzz-read-the-march-issue-of-project-apis-m-newsletter-and-meet-tammy-horn-potter/?. Kentucky State Apiarist, Tammy Horn at the 2014 Eastern Apicultural Society of North America conference. Photo credit: Ray Tucker, Jr.